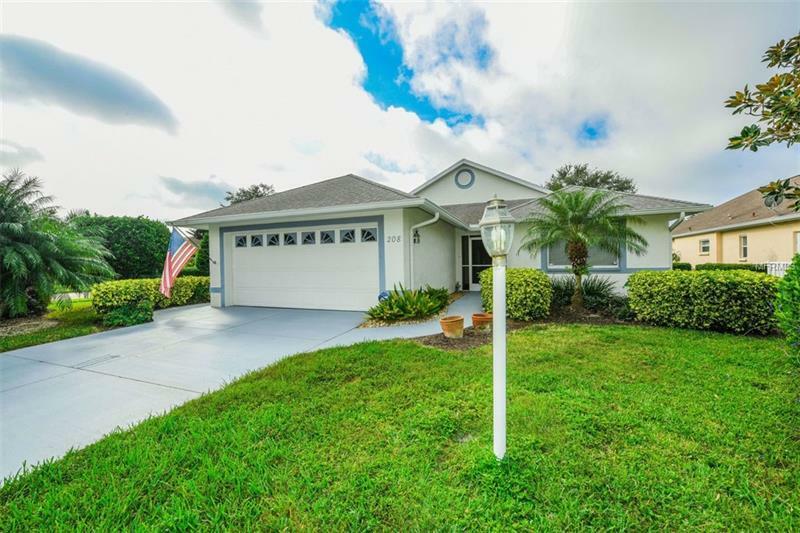 Prepare to fall in love with the charm & location of this 3 Bed / 2 Bath / 2 CG Venice Palms home on a beautiful and spacious corner lot. A cheerful and airy ambiance welcomes you as you enter the front door with freshly painted walls, new carpet and vaulted ceilings. An open floor plan carries onto a sunny Florida room with ceiling fan and sliders, perfect for enjoying morning coffee or a book in the afternoon. The master suite features a large bedroom with en suite bathroom and generous walk-in closet. An expansive utility room includes cabinetry and newer washer & dryer that convey. Mature and lovingly cared-for landscaping create a backyard oasis that makes this home perfectly prepared for you to make it your own! Venice Palms has no CDDs, no City Taxes, low HOA master fee of just $934 per year (plus $138 per month for the carefree lifestyle: lawn service, fertilizer, pest control, irrigation system maintenance, and more) Venice Palms is in an ideal location - only 4 miles to the Historic District and Venice Beach.